From early folk giants, such as James Taylor and Bob Dylan to today’s acoustic heroes, Ed Sheeran, Ben Howard and many more, there’s a wealth of artists to get you into this ever-buoyant genre. Generally with folk you’ll be playing fingerstyle, but standard strumming is commonplace too and sounds great with open-string drone chords. Altered tunings feature heavily and will help bust you out of any creative rut. Joni Mitchell reputedly made use of over 60 tunings to help her play different songs! We’ll begin our tutorial with a look at Travis picking. 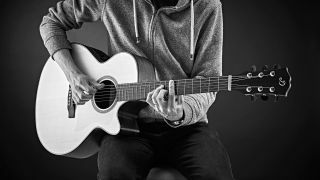 Named after country fi ngerstyle great, Merle Travis, this technique can be applied to almost any chord progression you like so the creative juices should really begin to flow once you’ve got the basics down. At its heart, it’s simply a matter of playing an eighth note bassline with your thumb while your first, second and third fingers play in between on the treble strings. Try out our exercises and get the basics down. Practise the thumb-picked bass part first here. This will help you develop independent movement between your thumb and fingers. Next try playing just the first few notes of bar 1 - just on the C chord. Once you’ve mastered this part, notice how we’re transferring the fingerpicking pattern to all the chords that follow. Moving into Chet Atkins territory, here we’re using the classic bass guitar technique of targeting the root, 3rd and 5th intervals for great results. Whether your chord shape starts on the fifth or sixth string will determine where the 5th interval is - and this is where you’ll need to spend time perfecting your thumb-picking accuracy. Folk-rock great James Taylor is an exponent of the complex harmonies that come as a result of using open strings in and around basic chord shapes. You’ll need to move your third finger to pick the first and second strings. Aim for a ‘free stroke’ technique, so your fingers pick into mid-air, rather than coming to rest on adjacent strings. This line uses open E tuning (E B E G# B E) and light strumming to give a readily identifiable Big Yellow Taxi vibe. Due to the tweaked tuning, it’ll force you to think a little differently about chord shapes and harmony, since you won’t be relying on tried and tested standard ones. Each of the tab exercises represents an idea or technique that you can apply to other chords. For our first and second examples change the chords and re-use the fingerpicking patterns. Almost any chord will work. The last two examples require you to identify the shapes we’ve used and think of musical ways to move them around the fretboard. Not every chord will sound great, so experiment!